A well-organised network of community trusts, international funding and support from the government has meant that a year after the earthquake, Kathmandu Valley’s damaged heritage sites are slowly rising again. In Kathmandu, Bhaktapur, Patan and other historic towns, reconstruction of temples is in full swing while on the same streets, homes destroyed by the quake are still in ruins. The reason is that while families wait for word on government compensation, local guthis have pushed ahead with reconstruction. There is a precedence for this because the Valley’s kingdoms have always had to rebuild on their own after earthquakes that strike once every century. The traditional mechanisms for earthquake reconstruction have been revived this time. “The government had set aside funds for us, but we are not waiting for that, we are rebuilding with donations, and got our drawings and materials approved,” said Sampurna Kumar Lama of Boudhanath Area Development Committee which is rebuilding the famous stupa. Nearly 450 monuments in Kathmandu Valley were affected by the 25 April earthquake last year out of which 83 completely collapsed. 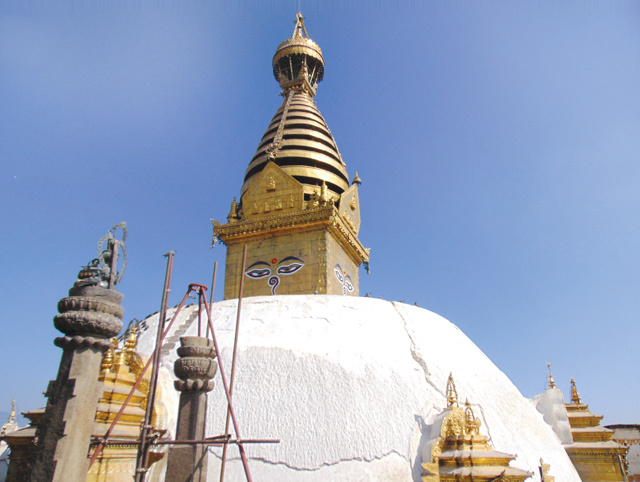 The government estimates it will cost up to Rs 17 billion to reconstruct them all, and says it is a priority to allow people to worship again and to help revive tourism. The cupola of Boudhanath is in scaffolding, work is underway to rebuild Swyambunath, locals are starting to restore fallen shrines in Patan. But wherever the central government is involved, there are delays and uncertainty. Most of the sites are either still being assessed, government departments are bogged down in paperwork, and the process of drawing up tender bids have delayed reconstruction. One place the government seems to have its act together is in Bhaktapur, where reconstruction of temples in the Darbar Square has started. “If we don’t face any obstruction, we hope to finish all the reconstruction in the next five years,” said Suresh Shrestha an archaeologist with the World Heritage Conservation Section of the Department of Archaeology. The department is also moving ahead with the reconstruction of Kasthamandap and exhibiting the new designs to the public and asking for suggestions. Perched on a hill that is believed to have risen out of the former lake that was Kathmandu Valley, stands the white dome painted with the iconic eyes of the Buddha. Although the dome itself withstood the earthquake last year, its peripheral monuments: Santipur, Anantapur, Pratapur, and Tashi Gomang all suffered and were badly damaged. “We are not waiting for the government, and have taken the initiative to reconstruct the smaller structures,” says Mahendra Ratna Buddhacharya of the Swayambunath Management and Conservation Committee. The south pillar and the bell at the entrance have been restored, and the committee is repairing the giant staircase leading up to the temple. Work on the public rest houses around the monument is also being carried out simultaneously. Murals on the walls of the destroyed Santipur, two pillars and some of the rescued artefacts have been transferred to the National Museum. Art conservators are working to preserve these and will return them to the destroyed monuments once they are rebuilt. The national government hasn’t been of much help. “If we got more support from the government we could finish everything in one year,” said Buddhacharya. The embassies of China and India have shown interest in reconstructing the monuments, but the committee is reluctant to entrust the reconstruction work to foreign entities since only designated priests have access to many of the holy Tantric shrines. Some of the most important temples of Patan Darbar Square were destroyed in last year’s earthquake, including Char Narayan, Shankar Narayan, Mani Mandap, Swotha and Radha Krishna. Of the 44 classified monuments in the palace square, 21 were damaged and the six completely destroyed. Having finally received approval of the government, the Kathmandu Valley Preservation Trust is working to reconstruct seven of the monuments and temples in the heritage site. 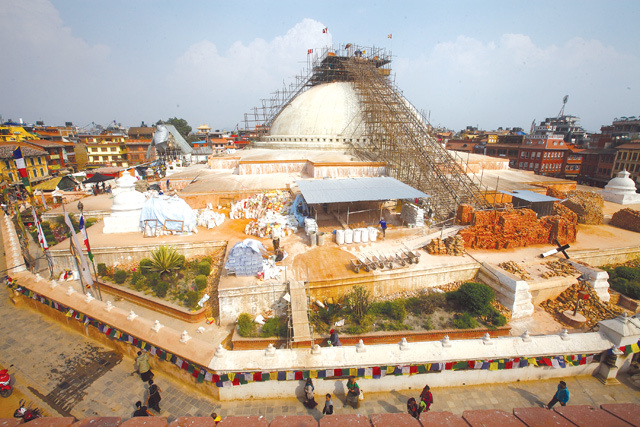 White sacks of cement are strewn around the damaged Boudhanath Stupa and a makeshift ladder takes workers up to the cupola. Renovation of the damaged monument is in full swing. “We were a little late in estimating costs which might have delayed restoration, but now we have started,” says Sampurna Kumar Lama of Boudhanath Area Development Committee. The committee received Rs 70 million in donations of the Rs 180 million needed, and the work started in January. Situ Rinpoche and Chinese Buddhist Association are some of the main contributors. 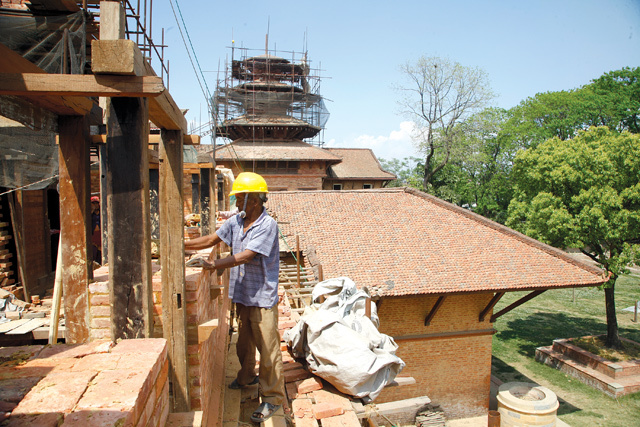 “We plan to use 20 per cent of the salvaged bricks and some of the timber to keep costs down,” said Lama, who adds that the committee also wants to make the new structure seismic resistant with pillars and timber frames to give strength to the stupa. “Unlike 1934, there was a lot of damage this time.” The reconstruction is expected to take another year. Bhaktapur suffered the most damage during the April earthquake, and unlike Patan and Kathmandu, a lot of residential buildings also went down besides some famous temples. Interestingly, temples restored by a German project in the 1980s all survived. Work has started on rebuilding the Sesh Narayan temple to the south east of the Palace of 55 Windows. “For this financial year we are working on nine projects at the cost of Rs 30.5 million,” said Ram Govind Shrestha, architect with Bhaktapur Sub-Metropolitan City Office. Of this, 70 per cent is coming from the Ministry of Local Development and the rest from the municipality. 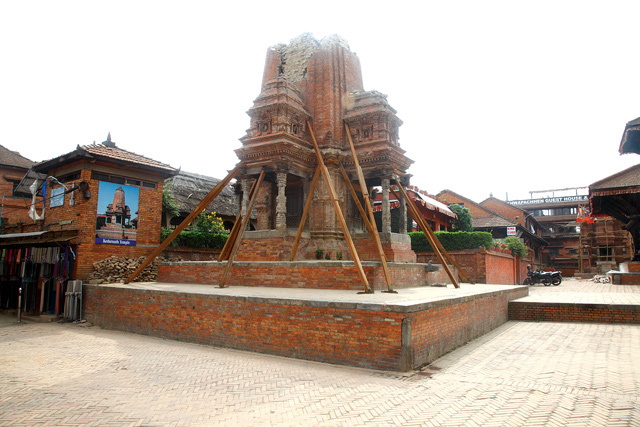 Out of the 139 classified monuments in Bhaktapur, five collapsed and 14 were partially damaged. Much of the reconstruction will use salvaged building material. Some of the temples destroyed in 1934 and rebuilt with inappropriate design, and which collapsed again last April, will now be restored to pre-1934 specifications. 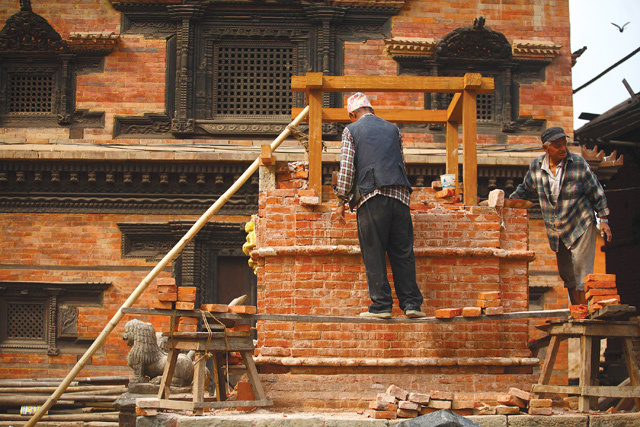 One obstacle is the shortage of masons and carpenters versed in traditional seismic-resistant building methods.